Do you experience persistent pain in or around your ears? Stiffness in your jaw or face? Does your jaw pop and click whenever you move it? If so, then you may be experiencing a temporomandibular joint disorder or TMD. 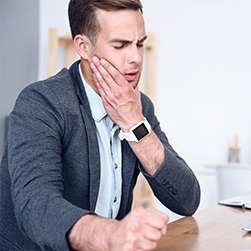 The TMJ (temporomandibular joints) are the set of hinges that allows your jaw to move fluidly in all directions, and like other joints in the body, it can sometimes develop strain or inflammation that can lead to pain in the jaw, head, and neck. Fortunately, Dr. Martinez has the specialty training to not only diagnose these kinds of problems, but provide long-term relief as well. Why Choose Glow Family Dental for TMJ/TMD Therapy? “TMD” actually describes a group of conditions that affect the jaw joint as well as the muscles and ligaments that surround it. They’re usually characterized by pain and dysfunction in the jaw, head, and even neck. Fortunately, most TMDs can be easily resolved with conservative measures, such as taking time to stretch and strengthen the jaw. 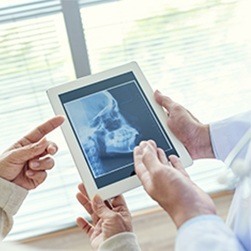 However, more advanced cases require treatment by a dentist or even a surgeon in rare instances. 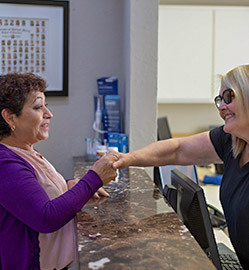 When a patient reports or exhibits the signs of a TMD, Dr. Martinez will perform a number of tests and scans to determine the root cause of the problem. He’ll test the mobility of the jaw and take X-rays of the joint to find any hidden issues. This will help him figure out the right course of treatment for each patient based on their particular situation. It’s very common for people with a TMD to hear a clicking, popping, or even a grating sound when they open or close their mouth. This is often caused by a disk shifting inside the joint. These sounds can sometimes be audible to someone standing next to a patient! Clicking itself isn’t a big issue, because many people experience this, but if the clicking is accompanied by pain or stiffness—such as the jaw becoming stuck while opening or closing—this clearly indicates a TMD. If pain can be felt in the cheeks (masseter muscles, or the “chewing muscles”) or the temples, this is also a very common symptom of a TMD. 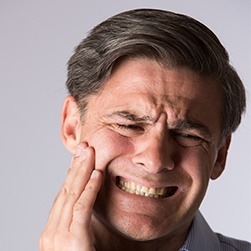 Usually, this kind of pain is felt in the morning, and it’s typically related to habits such as jaw clenching and teeth grinding during sleep. If you have this kind of habit, a custom-made oral appliance called a nightguard can help address the issue. It reduces the force applied to the teeth while a patient sleeps, helping the muscles in the jaw, face, and head relax. Pain that comes from one or both jaw joints can actually be described as arthritis of the TMJ. Interestingly enough, TMJs that look arthritic in X-rays sometimes exhibit no pain or dysfunction at all, while others experience extreme discomfort and limited function. There is no cure for arthritis, but medication can be used to help manage and lessen the symptoms. As we touched on above, figuring out the right treatment for a patient’s TMD will largely be based on their individual circumstances. Temporary measures like switching to a softer diet can help reduce stress on the muscles and joints, and applying cold or heat can relieve soreness or inflammation in the area. Gentle stretching exercises can lessen muscle spasms, and OTC medications can also provide immediate, (if short term) pain relief. If a patient’s jaw pain is due to a misaligned bite, this means that the teeth are not coming together properly, preventing the muscles in the face and jaw from ever reaching their natural resting position. This can lead to tension that quickly turns into pain. To relieve it, we can reshape a few key teeth to make sure that they come together properly. Once the bite is properly balanced, strain will be taken off of the jaw muscles, which should help any pain go away. 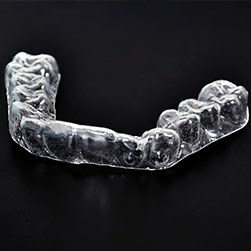 An occlusal splint is a type of therapeutic mouthpiece that a TMD patient wears to bed. It slightly adjusts the position of the jaw to help the muscles in the area relax and heal, and it can also protect the teeth from nocturnal teeth grinding. 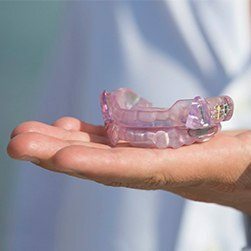 After a few months of consistent use, the jaw will adapt to this new position, and a patient should be able to go throughout their day completely symptom-free. 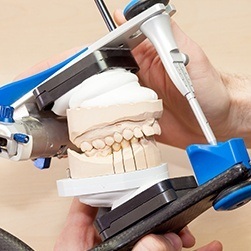 In cases of a severe TMD, more involved treatments may be necessary, which could include orthodontics or restorative dental work in order to create a more balanced and functional bite. There are also minor procedures that can be performed on the joint itself, such as cortisone injections or lavage (flushing) of the joint. In very rare instances, surgery can be used to correct a TMD. Before any of these procedures are recommended, Dr. Martinez will start by using conservative and reversible treatments and seeing how they work.